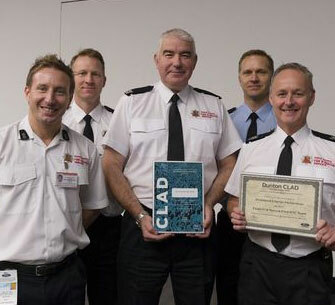 Essex Fire & Rescue Service’s road traffic collision (RTC) extrication team has received an award from Ford Motor Company in recognition of its achievements earlier this year in qualifying for the World Rescue Organisation Challenge. The team received the award as part of Ford Motor Company’s Chairman’s Leadership Awards for Diversity 2015 which took place at the car giant’s Dunton site on 3 December. Divisional Officer Nigel Dilley, RTC Extrication Team Manager, received the award on behalf of the team. Nigel was joined at the ceremony by team members Kevin Mitson, Jeremy Tuckwell, Kelvin Tuckwell and Adrian Richardson. The other team members – Antony Clement, Nick Singleton and Mick Lawrence – were unable to attend. Nigel Dilley said: “It is a great honour to receive this award on behalf of Essex County Fire and Rescue Service. It celebrates the excellent partnership work that has been in place for a number of years. “The ceremony also gave us a chance to thank Ford Dunton for their support in helping to develop the RTC Extrication Team, allowing us to represent the United Kingdom at the World Rescue Organisation Challenge in Portugal in October this year. The extrication team has enjoyed a very successful 2015. In August the team achieved its best ever result in the National UK Rescue Organisation Challenge. The Essex team was one of 23 teams from around the UK which took part in the various challenges, with the scores being averaged out over the two days of competition. At the end, the Essex team achieved a very creditable fourth position overall at the event which took place at the Fire Service College in Gloucestershire. A month earlier, the team finished runner up in the Humberside Regional Road Traffic Collision and Trauma Challenge which was held at Seven Lakes Country Park, Crowle on 11 July.